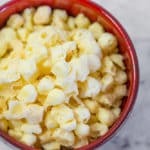 Keto Popcorn Cheese Puffs - One Ingredient EASY! You can buy them but they're much cheaper to make and you can make a bucket load of Keto Popcorn if you like the cheese puffs nicely once dry. Cut the cheese into small ¼ inch squares. Place on a cookie sheet lined with parchment paper and cover with a clean tea towel (dish towel). Leave the cheese to dry out for at least 24 hours (you might need to leave it longer if it is humid where you live). The next day preheat your oven to 200C/390F and bake the cheese for 3-5 minutes until it is puffed up. Leave to cool for 10 minutes before enjoying.